Sergeant E-5 and Company Medic for L Company Rangers 75th Infantry 101st Airborne Division (Airmobile) was Born on 5 July 1951 in Pocatello, Idaho. He died on 15 February 1971 in a tragic helicopter crash outside of Camp Eagle, Northern I Corps Republic of Vietnam during a night rescue operation to save a wounded Ranger. After a brief firefight with a Ranger Team deep in enemy territory, one Ranger was severely wounded. The decision was made to attempt a night extraction in bad weather. A UH-1H 2/17th Air Cav Helicopter, with four crewmen, a Ranger Officer and Ranger medic SGT England aboard, departed Camp Eagle at approximately 1840 hours on 15 February 1971 during a period of very marginal weather on an emergency night evacuation mission. The pilot reported a ceiling of 300 to 400 feet and one-half mile visibility. Ranger England, Ranger 1st Lt Jim Smith and the Helicopter crew flew out to the Roung Roung Valley about 30 miles southwest of Camp Eagle. There were still a number of NVA soldiers in the area and the wounded Ranger would not be able to keep up with the Ranger Team if they had to make a run for it. Night extractions were always risky, especially when there were low-hanging clouds and mists of rain. Unfortunately, that evening the weather was getting progressively worse and knowing full well the hazards, it is to their credit that these men, including the helicopter pilots and crew, volunteered for the rescue mission. Using the abandoned US Firebase Brick as a reference point, the aircraft flew cautiously out to the team's location. When they spotted the Ranger team's strobe light flashing in the jungle below, the helicopter moved in quickly and Lt. Smith kicked out the rope. Before any remaining enemy soldiers in the area could respond, the helicopter extracted the wounded Ranger, Sgt Gabriel Trujillo, using a STABO Rig to lift him above the jungle canopy. 1LT Smith had volunteered to go along as "bellyman" for the STABO rig extraction. The flight back to Camp Eagle was under instrument conditions. As the aircraft approached Camp Eagle, the pilot reported vertigo and that he was unable to see the ground. Vertigo is a total loss of one's sense of direction. A normal ground-controlled approach (GCA) was established with the aircraft proceeding inbound until about the three-mile point, where the aircraft descended below glide slope in a right turn and disappeared from the GCA controller's radar scope. At about 1952 hours the aircraft impacted nose-low, broke up, and burned. Unfortunately, the helicopter pilot was unable to regain his bearings and the helicopter flew straight into the ground immediately killing everyone on board as well as the wounded Ranger dangling from the rope below the aircraft. Sgt Steven England and the other men died trying to save the life of a fellow Ranger. 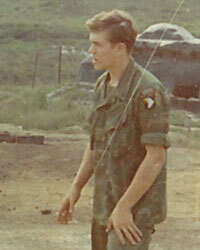 He is listed on the Vietnam Memorial Wall at Panel 05W Line 106. Ranger England's awards include the Purple Heart, NDSM, VSM, VCM, Basic Parachute Badge and Combat Medic Badge. Ranger England was 19 years old at the time of his tragic death. It is altogether fitting that we honor him today at the Fallen Ranger Memorial. Rangers Lead the Way!